Let me start by saying thank you. Every time we meet I find out more and more just how much you care about every customer that comes in your door. It is really inspiring to know that I have you both in my corner to help me with my learning or assistance to get me out of a jam. What is so unique is you do it because you want to and not because you have to. I owe you both my passion for guitar and for that I again have to say thanks, while re-affirming that the care I spoke of goes both ways. It must have been the stunned and overwhelmed expression on my face that prompted another customer at a music store in the Vancouver area to suggest that I go to Bluedog Guitars to purchase my first guitar. Being a petite, small-handed woman, I was concerned about what kind of guitar would be best suited to me. Jenn was so excited to help me when I showed up at Bluedog and found the perfect guitar for me. Although this store obviously caters at least in part to experienced guitar players looking for high end guitars, Jenn and Paul never made me feel 'dumb' or 'awkward' about my newbie-ness and stock their charming space with guitars for a variety of people with a variety of budgets and abilities. I feel my new GS Mini will be a guitar I can use now, and grow into over the years once my fingers have calloused and I've mastered this frustrating D chord! Paul spent time with my husband teaching him how to change the strings, and we left the store feeling that we had been properly accessorized with the necessary tools (tuner, etc.) but not oversold too either. I better educated about my guitar and what we were getting ourselves into as new players... and better educated about the guitar world in general. We will certainly be back ... probably for one of the shows they host in their unique space. I just opened the guitar. Oh my god, is it ever a beautiful example of Zen Master Hoover’s artistry and wizardry. I can’t believe the depth of the tone, the overtones, the craftsmanship, the whole package. The action is set perfectly for my style of play. And with a slight amount of mental adjustment, I quickly adapted to the nut width. I love the neck, too. I haven’t had this type of neck from Santa Cruz before, so that actually made adjustments a bit easier. Jenn, my buying experience with Blue Dog Guitars was exceptional. I love meeting shop owners like you and Paul. You’re just good people who love guitars and want to share it with the world by taking exceptional care of your customers. You went the extra mile to make sure I didn’t make a decision I would regret. I’m an extremely happy customer. Thank you for everything. Oh, and I LOVE my T-shirt. Thank you for that as well. I got the BRW F50 today - I have been playing it until now since I received the delivery this afternoon, and everything is perfect; thank you so much, and please say a big thank you to George as well. I have visited a lot of guitar shops and have played/owned so many high-end guitars, but Bluedog and Lowden are the best in the world for sure; I will definitely visit your shop when I go to Vancouver. I really appreciate everything that both of you have done. I will keep playing it for the rest of my life. Just wanted to say thanks for the wonderful service and attention that you give to your customers. I am a very happy camper with the Wee Lowden, what an awesome guitar. I received the Cargo and I'm loving it. It arrived on the day you said it would. The graphic and the finish are gorgeous. It might be the most playable guitar I've ear owned, and it sounds great through my Fishman Loudbox or unamplified in my living room. Had it in my trunk in 100 degree weather for a whole day and it was perfectly in tune when I took it out. Been playing gigs with my band Green Dog, lots of positive comments on the guitar. You guys were a pleasure to deal with, thanks for the experience. Jenn, I wanted to tell you and Paul how happy I am with the Stonebridge Nylon. It plays like a dream. I also wanted you guys to know how happy I was with the overall service. I've never purchased a guitar over the net as I've always had to play it first but I had a good feeling about this one and I was right. Again, thanks for making the transaction so seamless. As a session musician, the quality of my equipment is the difference between working or not. All of my dealings and transactions with Jenn at Bluedog have been excellent. Their commitment to the customer is second to none. Bluedog continually goes above and beyond what we come to expect from any retailer. I highly recommend Bluedog for anyone looking for the finest guitars and supplies. These guys know there stuff, stand behind it and work hard to win your business. Drop in and see Jenn or visit them online, you won`t be disappointed. I had been following Bluedog Guitars on line from Florida for quite some time. I finally had the chance to visit during a convention in April. It was a wonderful experience! Jenn and Paul were fabulous! They have an amazing shop where each instrument is more extraordinary than the next. They spoke with me and one of my friends from the convention for several hours. We learned a lot about the guitars and their builders, and I feel like we made some friends too! I highly recommend Bluedog Guitars! I live outside San Francisco, and I just purchased a Linda Manzer from Bluedog Guitars in North Vancouver, BC. Arrangements were made and the agreed upon price was almost ten thousand dollars. At all times, the staff were very courteous and helpful in dealing with me. True to their word, the guitar arrived 2nd day delivery with no delays whatsoever. Examination of the guitar revealed it to be just as they described. The store is very professional and trustworthy. Jenn and Paul will take care of all your musical needs. If you are on the journey into the world of handmade quality guitars you would know that there is no road-map and therefore every step is 'trial and error'. But how to minimize this often expensive risk? Very shortly: Find the very best music shop, one you can trust and one that will support you and give you the time you need. You will find those rare and unique qualities at Bluedog Guitars, plus they have knowledge that most players do not have. On top of that, they are great people and genuinely interested in you finding the right guitar. For a small boutique they have a wide guitar selection from the most renowned guitar makers in the world – a real treat. They truly deserve to be here and supporting them is also supporting guitar makers, both local and international. I have bought almost too many guitars from them, but I’m happy they are here! Wow! I haven't even figured out how to describe this guitar! Jenn, it's everything I was hoping for and then some. From the first chord I have been totally mesmerized and ended up playing many long hours this weekend until my fingers were too tired to keep going. Also, my wife quickly forgave the indulgence as soon as she heard the beautiful and captivating sound of this guitar. I had a few doubts in buying an unknown guitar which I wasn't able to try out first, but am really happy I went ahead with the purchase. The set-up and playability is terrific, and the guitar seems so well balanced it's easy to play and make it sound good. You guys are top-notch all the way....Great Price, Great Service and a Great Guitar. Thank you for everything. I absolutely LOVE the guitar. You guys wrote the book on customer service and customer relations. I've dealt with a lot of guitar shops & dealers the last 40 years..and you guys are the nicest & fairest people I've come across in a long while. It is refreshing. Keep up the good work. Hi Jenn, thanks for your time yesterday morning and my congratulations to you & Paul (...& dogs!) for the awesome shop.... one of the most refined and quality that I've seen in my tours around the world. All the best, arrivederci ;-)"
This is just a belated THANK YOU for making Barry's time at your shop so incredible. He's been playing and buying guitars since he was a teenager, but has never been in a shop as wonderful as yours. It wasn't just about the amazing guitars, it was also about your attitude, openness, willingness to let him sample your incomparable guitars. The level of interaction ("hmm, here's one you might like")? well, I'm running out of superlatives…..we've just never run into anything like it. He's already planning to win the lottery and fly back and says he's going to play every one again and choose without looking at the price. I think he'll choose the 40th Anniversary Lowden! What an awesome guitar. Anyway, thanks again for your time, attention, suggestions….just all-round niceness." Bluedog Guitars has delivered a gift to the guitar playing community. When I decided to purchase a new guitar, I came to fully appreciate just what they have done for us. I was able to not only see and play a huge variety of stunning guitars from some of the best luthiers in the world, they are dedicated to ensuring you get the right guitar for you.You owe it to yourself to check them out! Jenn was especially patient and kind when I bought my Huss and Dalton 12 fret CM. It took me almost 6 months to make my decision, but it was love at first sight. I could not be happier here in RI with my new guitar. Jenn made the process easy despite time and distance, grateful to all of you at Bluedog Guitars. Bluedog Guitars puts the best guitars into perspective. So often a shop only carries one or two artist quality acoustics. At Bluedog you can play dozens of the best acoustic instruments being made in the world today. Jenn, Thank you for the very pleasant reception you gave me in your fine shop last week. Not only do you stock a most impressive array of blessed instruments, but you are also very accommodating. I have been in lesser guitar shops where the staff keep clients away from the instruments. You, on the other hand, draw people towards them. I travel extensively and have visited many guitar shops, but your's combines warmth and quality, a rare combination. 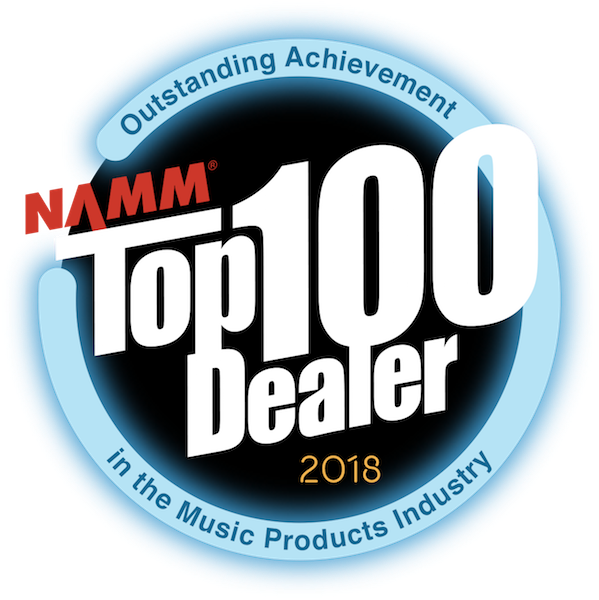 You are truly deserving of an NAMM nomination, but client recognition will last forever. In January, 2014 I was shopping for a new guitar ( a Christmas present from my wife). I visited a couple of larger music stores where I was mostly left alone while I explored the inventory. As an aging novice player with modest aspirations I struggled with finding the right instrument for me. Then, by chance, I stumbled on a small, off the beaten path, shop with the unlikely name of Bluedog Guitars. When I walked in I knew I had found something special. The space was micro but also warm and inviting with a mini humidifier puffing moisture for the benefit of the wonderful selection of acoustic guitars. I was greeted by the smiling, friendly faces of the owners, Jenn Ladd and Paul Haggis. They took the time to gently introduce the many options that were available to me. I listened, I played, I asked questions, they patiently and knowledgeably provided the answers. I didn't buy that day, but a couple of days later I was back and left with a preowned guitar that greatly exceeded my expectations for quality of sound and playability. I then joined a series of group lessons conducted by Paul and have continued to enjoy each and every one to this day. Late last fall I decided to take an even bigger step and am now the proud owner of a new custom Morgan acoustic guitar. It is an instrument of beauty! Jenn and Paul are the real thing, genuine, honest folks who have put their hearts and souls into creating a niche music business that has touched the lives of so many guitar enthusiasts in the Vancouver area and beyond. My thanks and best wishes for the future. As a person who is insanely in love with the sound, look and feel of high end acoustic guitars, Bluedog is the proverbial candy store of my fantasies. The owners are extremely nice to chat with and handle their inventory of dreams waiting to happen with tender loving care. I’ve been to just about every guitar shop within two hour drive of me and, well frankly I’m usually disappointed. Not so with Bluedog Guitars. Thank you for having the courage to see your vision through and I hope your business, like finely made Guitar’s, only gets better as years go by. Bluedog Guitars is a remarkable music store where one can happily try an incredible range of beautiful hand crafted instruments all begging to be played and find new homes. The atmosphere is very unpretentious as are the owners. No pressure at all to buy. They want to set you up with what is best for you the customer. The minute you step inside you feel like a kid at a candy store.. so many wonderful instruments! Bluedog Guitars is Awesome period. No one more deserving of an honour for their dedication to keeping the ‘music’ in ‘music store.’ Best guitars, best advice, best welcome in the business. You have made a great contribution to the music scene in Vancouver and provided musicians with the opportunity to make more informed and better choices with their instrument purchases. It's an education just to stop by and try out the variety of brands and styles you have in your shop, including the many local luthiers. The atmosphere at Bluedog is welcoming and comfortable for musicians at any skill level. And some of the live music that gets played there! Wow! Lot's of times it's good to just sit and listen. I know I'll be back.